The question must be asked though: Is China really pushing for a safer future, and pioneering a nation-wide effort to combat global warming? Or is it just a master greenwasher, in a bid to sell itself as a bastion for modernity and progress? To start off, allow me first to shed some light on the newly implemented Environmental Protection Tax Law, which came in to action at the beginning of this year. This new law will create a carbon market in China by taxing businesses for their greenhouse gas emissions in a bid to combat pollution, and limit China’s mammoth contribution to global warming. However, by taking a look at the list of ‘taxable’ air pollutants, which is lost somewhere way down in the appendix of the law’s draft, you’ll see that the most important GHG, carbon dioxide, is nowhere to be seen. It doesn’t even make the list. So how much of a difference is this policy actually going to make? China is fully aware of the imminent need to curb CO2 emissions, but chooses not to address this. Wipe the greenwash away, and this tax law fails to tackle one of the largest problems at hand when it comes to mitigating climate change. Wipe the greenwash away, and this tax law fails to tackle one of the largest problems at hand when it comes to mitigating climate change. Secondly, it has also been reported in the news that China plans to plant new forests that will total a land mass the size of Ireland. For us Brits that sounds pretty massive, but amounts to around 1% of the country as a whole. Planting forests has always been recommended as a great way of storing carbon and mitigating global warming in a natural way. Schemes such as REDD+ have taken off in the past decade as a way of counterbalancing CO2 emissions with the protection of rainforests. Alas, China’s grand scheme of planting of forests seems to be following a different trajectory altogether. The chief of the State Forestry Administration, a Mr. Zhang Jianlong, announced that the planting of 6.6 million hectares of forests will increase forest productivity as well as imports and exports. He talked of how inadequate forest ‘resources’ were a significant cause of a lack in ‘ecological products’, and that 2018 forest product import and export business hopes to rise by 10 billion U.S. dollars from 2017 figures. Furthermore, China’s State Forest Administration have been pushing for domestic timber supply to rise from the 180 million m3 /annum figure of 2010 to reach 300 million m3/annum in 2020; this is a path they are still on, and goal they have not met yet. In terms of biodiversity restoration, the type of monoculture forests they intend on planting will do very little towards such conservation ends. Although this afforestation plan represents one of China’s efforts to become a world leader in conservation and shed its polluting image, it is difficult not to question their true intent. Lastly, China has become the largest manufacturer and exporter of environmental technology and green energy. 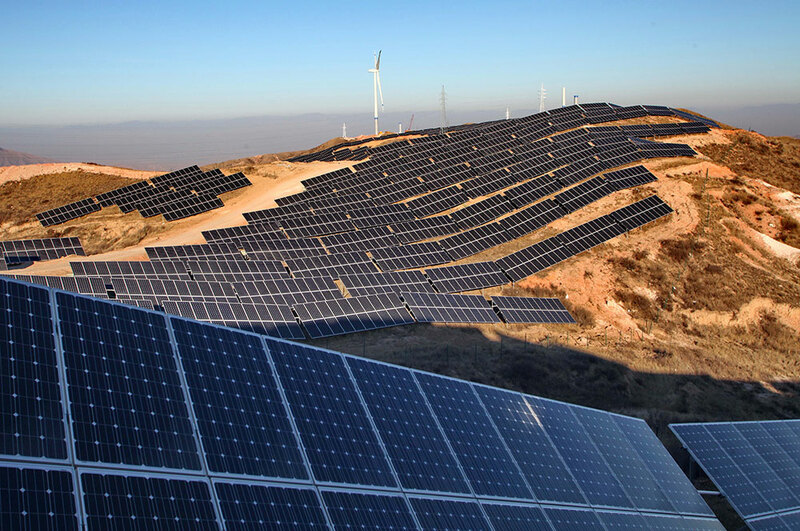 PV production hit 2020 targets three years in advance, and The Independent reported that 5 of the top 6 solar module manufacturers, 5 of the largest wind turbine manufacturers, and 6 major car manufacturers committed to electrification are all Chinese-owned. China is without a doubt moving in the right direction with regard to manufacturing and using renewable energy sources, in contrast to the US and other western countries. But do geopolitical gains outway genuine environmental consideration in its decision making processes? China knows it’s own capabilities in becoming a bastion for modernisation and a leader of sustainable development, however it still has a long way to catch up on the environmental front. President Xi Jinping himself opted to use the word “torchbearer” rather than “leader” when he discussed China’s role in climate change mitigation. China is more than happy to tactically join onto the end of the emerging conga-line of ‘green-economies’, but is not yet prepared to declare itself a die-hard devotee of the green ethos. China is more than happy to tactically join onto the end of the emerging conga-line of ‘green-economies’, but is not yet prepared to declare itself a die-hard devotee of the green ethos. China’s consumer market are repeatedly tricked with greenwash campaigns. Whether it be companies making partnerships with the WWF while at the same time making special offers on yellowfin tuna, or government promises of new eco-cities which end up in fact being normal carbon-intensive high rise flats. The Chinese population, and now it seems the mainstream media and international readers are slowly falling for the facade. China’s agenda has, and no doubt always will, prioritise business interests. It is more concerned with its position in global politics, and remains obsessed with continuing to increase production, imports and exports. Its’ corporations commodify nature, externalise environmental destruction and pollution, and by adding insult to injury, attempt to then greenwash their endeavours. Don’t believe the hype.